Creating beautiful, hand-made treasures from the heart. This is another one of our cards from Saturday's 10 for $10. I thought this was a really fun one! I'm choosing to post this card today because I could use something bright and cheery after all this rain and cloudy weather we've had for the past several days! I used a Real Red brad to make the little cherry 3-D and I added some Crystal Effects to the drink to give it a little shine. The Congrats set was a nice one to use on this card, as you have a wide variety of phrases to choose from to put on the inside. Super cute! Love the red brad as the cherry! That reminds me...I haven't used that set in a while. I think it's time to break it out again! 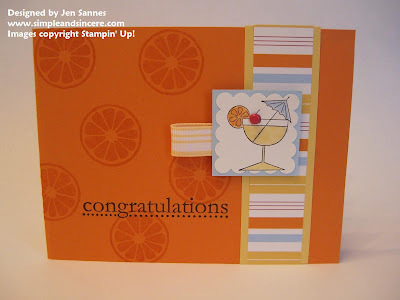 Love the colors on this card, Jen. Wish I could have made it to that class. All content Copyright 2011 by Jen Sannes. All Rights Reserved. Duplication is prohibited without the written permission of the author.